Could JBehave be an evaluation engine for this? Behave must have a Gerkin like interpreter build in right? Gwen is an alternative to JBehave and is it’s own Gherkin interpreter. In JBehave you write POJOs to map steps and pass in a service. In Gwen you write an engine to map steps and a context to manage your service and state. 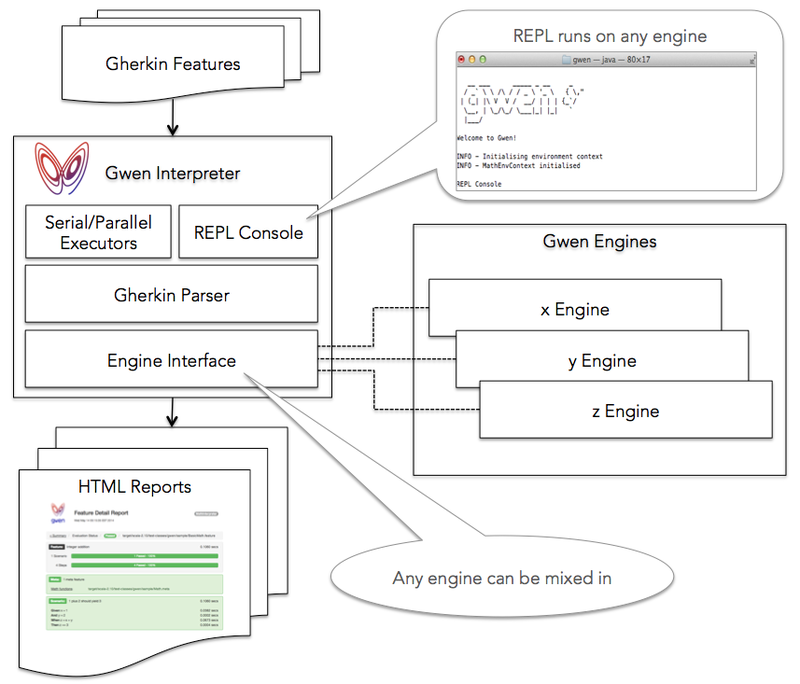 The lifecycle of the context is managed by Gwen and passed to the engine at execution time. So you would not typically embed one interpreter in another. But you could potentially wrap a JBehave step def POJO in a Gwen engine and have Gwen delegate the processing of each step to it. To do this you would have to map each step to a method on the POJO (perhaps dynamically through a reusable adapter that introspects the JBehave annotations). It’s a level of indirection, but it would give you a REPL for free and all the other Gwen features too. I like the idea of one set of Gerkin steps (not sure of the terminology) driving different testing engines and that seems to be at the heart of Gwen. Another question – would modifying Gwen be more assailable if it was written in Java or Groovy? Or do you think that being more of a framework makes this not matter as much? Being open source, I think it does matter. Scala is both statically typed and expressive. I’m hoping that this is a win and that the community can easily get involved.